Jamie VI an I (19 Juin 1566 – 27 Mairch 1625) wis Keeng o Scots as James VI, an Keeng o Ingland an Keeng o Ireland as James I forby. He ringit in Scotland as Jamie the Saxt frae 24 Julie 1567, whan he wis anerly ae year auld, takkin ower frae his mither Mary, Queen o Scots. 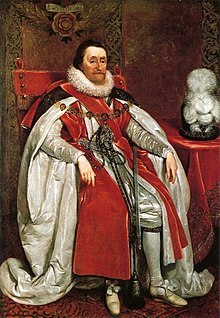 On 24 Mairch 1603, as James I, he succeedit the pokeshakkins o the Tudor faimly o Ingland an Ireland, Elizabeth I, that dee'd athoot ony bairns. Efter the personal union o the three crouns, James wis the first tae style hissel "Keeng o Great Breetain", but the teetle wis rejectit bi the Inglish Pairlament an haedna ony foond in law. The Pairlament o Scotland cawed agin it an aw. Wikimedia Commons haes media relatit tae James I of England. This page wis last eeditit on 23 Februar 2018, at 20:14.